This morning I felt like reading, but I didn't want to get stuck into any long books until the new year. So, I looked through my Kindle and decided to read this bizarro story. Hubby and I watched the movie years ago and really enjoyed it. I'm glad the story turned out to be just as good. 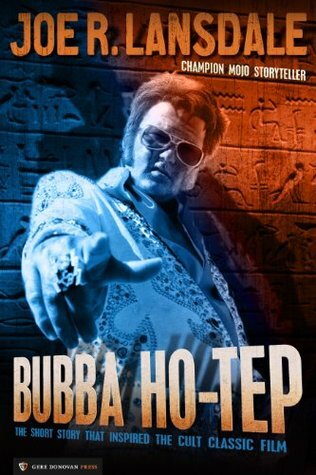 Sebastian Haff is convinced he's Elvis Presley and is now an old man living in the Mud Creek Shady Rest Convalescent Home. He oftens regrets a lot of his decisions in the past and is still very obsessed with his pecker. Yep. He can't stop thinking about it, or looking at it, or remembering some of his conquests. But the night he saves his friend, Jack McLaughlin--who is convinced he's a brainless, dyed version of JFK--everything changes. The two men are convinced there's a soul-sucking Egyptian mummy roaming the corridors of their home. And none of their fellow 'celebrity' oldies are safe. Together, they hatch a plot to get rid of it. But can two old guys with failing bodies and confused minds take on an ancient evil?